Development and environment was a major issue of the 20th century and the debate continues in the 21st century. The economic development programs based on ‘fossil fuel economy’ essential to deliver a minimum quality of life to people, is also threatening their existence. Mankind is caught in a vicious circle of ‘economic development vis-a-vis environmental degradation’. In the name of development, the world today produces more instruments to ‘kill’ rather than ‘cure’; spends thousands times more resources on building of ‘weapons of mass destruction’ than on all economic programs for human development – to eradicate poverty, hunger, and malnutrition. Environmental degradation and economic decline (aggravating poverty) feed on each other, and the fate of the poor and the fate of the planet (Earth) have become tightly entwined. Economic deprivation and environmental degradation thwarts all efforts towards sustainable development. Although the desirability of development is universally recognized, recent years have witnessed rising concern whether the environmental degradation will limit development, thus impairing the quality of life of present and the future generations too. The first volume of the book sub-titled as ‘Price of Unsustainable Development’ unravel some of these issues. Mankind will perish if the protection of the environment does not become an integral part of all our developmental programs. We need to plan for ‘Development Without Destruction’ based on the ethical principle of socio-economic equality and ecological sustainability. Economic development and environmental management (restoration and improvement) programs should go hand in hand. Clearly, the new paradigm of development is not the game of economics alone. All issues- ecological, social, political, cultural and technological have to be merged together in decision making for sustainable development. They are mutually reinforcing. Technology has more important and responsible role to play as it drives development. Making economic development programs less dependent upon the ‘fossil fuels’ and more dependent on ‘renewable energy sources’, ‘less energy and material intensive’ and more ‘equitable in its social and economic impact’ on global level is the need of the hour. 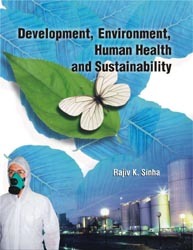 The second volume of the book sub-titled as ‘The Wisdom of Sustainable Development’ highlights some of these issues.